The berserker was a category of norse warrior, tipically a mercenary or a bandit; but the main feature of those was the berserksgangr: a condition of fury that made the berserkers invincible. The colloquial expression to go berserk represent this blind fury for the battle. Many scientists think that the origin of the berserker's fury was a mix of drugs (particularly claviceps purpurea ), condition of trance (induced by religious rituals) and stress reaction for the battle (figth-or-flight ). But the study of Jesse L. Byock suggest as main cause of the berserker's fury the Paget's desease of bone . The PDB is a chronic disorder that can result in enlarged and misshapen bones. Paget's is caused by the excessive breakdown and formation of bone, followed by disorganized bone remodelling. This causes affected bone to weaken, resulting in pain, misshapen bones, fractures and arthritis in the joints near the affected bones. 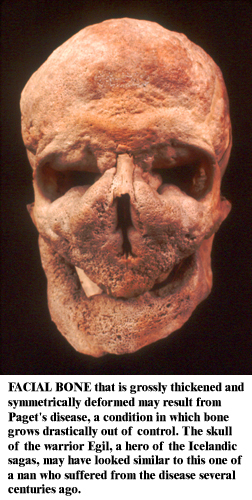 Often Paget's disease is localized to only a few bones in the body. The cause is unknown, but genetic factors, particularly SQSTM1 mutations , and environmental factors are important. Probably another cause of the PDB is the infection of paramyxovirus . The second translation is probably the closer of the real meaning of berserker: people who suffer from PDB in cranial area develop deformities that could transform the aspect from human to beast, like a bear. 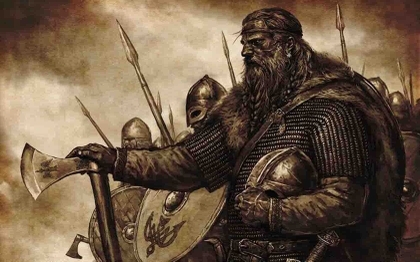 In defence of this theory Byock quote the finding of the skull of Egill Skallagrimsson" , one of the most famous berserker of history known for the Egill's saga, where he is described with a big and ugly face . Probably the figure of the berserker has a lot of mistery and legendary sides and obviously one single explanation in insufficient. The berserker behavior was a mix of more causes: religion ritual, drugs potion and deseases. The PTB is a interesting explanation and theory that try to bring science among the history.